ENGLEWOOD, Colo., Sept. 6, 2018 /PRNewswire/ -- DISH today launched DISH OnePoint, an interactive app that gives business owners the ability to control multiple televisions from one interface using iPad and Android tablets. 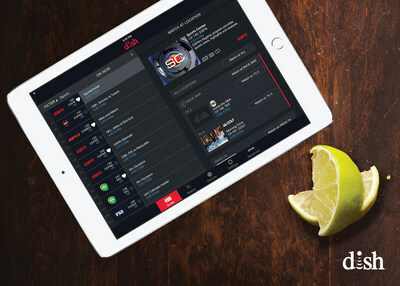 Users can use the DISH OnePoint remote app to efficiently manage large entertainment systems at properties installed with DISH set-top boxes, like sports bars, restaurants, fitness centers and waiting rooms. "For businesses with multiple TVs, DISH OnePoint eliminates the stress of mixing up remotes or scrolling endlessly through the programming guides," said Alistair Chatwin, vice president of DISH Business. "Now customers don't have to miss a second of their team's game or favorite show while waiting for employees to find the right channel – DISH OnePoint creates a better television experience for everyone." DISH OnePoint is available at no additional cost on iPad (iOS v10 and up) and Android tablets (v6.0 and up). The app is compatible with Wally, DISH's set-top box for businesses, as well as Hopper (all generations) and Joey (all models) receivers, when connected to the internet. Support for Hopper Duo coming soon. For more information, visit dish.com/business or stop by the DISH booth (#1014) at CEDIA from Thursday, Sept. 6 through Saturday, Sept. 8.